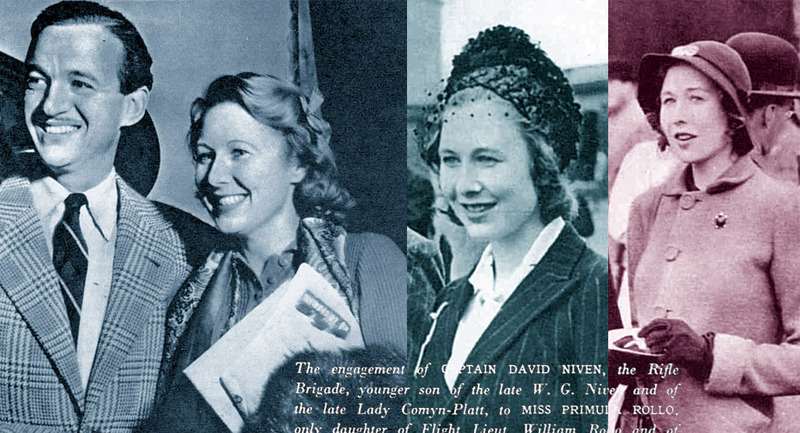 Primmie Niven in 1941, 1939, and 1939. 18th February 2018 marked the centenary of David Niven’s first wife Primmie’s birth. She died on 21st May 1946, aged 28, due to a silly accident that has always made her untimely passing seem so much sadder. Eighteen months after Primmie’s death, David Niven confronted a stubborn Swedish model on the set of ‘Bonnie Prince Charlie’ who had been refusing to vacate his canvas chair. They were married six weeks later. However, according to almost everyone who knew David, he never recovered from losing Primmie. We’ve looked at Hjördis’ pre-Niven years in some detail, so I think it’s fitting (and interesting) to look at Primmie’s. She certainly packed a lot into her life. 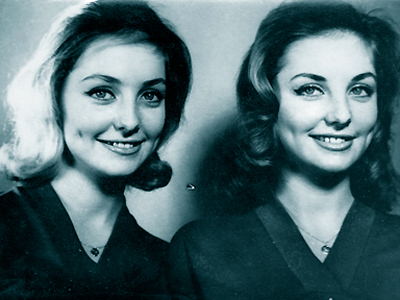 She was born Primula Susan Rollo, the only daughter of well-to-do divorce lawyer William Rollo and Lady Kathleen Hill. Her aristocratic roots came from both sides: she was the great-niece of Lord Rollo of Duncrub Castle in Scotland, and grand-daughter of the Marquis of Downshire. As such, she became a regular on the landed gentry social scene. “Miss Primula Rollo, who has been in the wars.” January 1936. From around the age of nine, she was pictured in upper class lifestyle publications such as The Tatler and The Bystander; attending garden parties, balls, hunts, polo matches, more hunts, and horse races. She also made the news in December 1935, following an accident in Munich, when her car was struck by a tram: “The car was wrecked. Miss Rollo received slight injuries.” What was she doing there?… Primmie’s finishing school was in Nazi Germany. (If you’ve just done a double-take, it’s well worth taking a look at this Spiegel Online article: ‘British girls in the Third Reich‘). A British publication pictured Primmie back home a month later, all tweeds and crutches, with the caption that she’d “been in the wars”. Five years later she literally was in the war. By August 1940, when she met David Niven, Primmie was an assistant section officer in the Women’s Auxiliary Air Force. In 1971’s ‘The Moon’s A Balloon’, David described a first shared glance / stare at the Cafe de Paris in London, and then running into her during a lunch-time concert at a museum. “She squealed and her dog bit me. She said ‘Why the hell did you sit on my dog?’, and I said ‘Why the hell have you got a Pekingese in a trench anyway?’ and that’s how we got acquainted.” The story was rounded off by saying that they were married three weeks after the slit-trench meeting. Another alternative story, which did not emanate from David, was that he met Primmie at a pub frequented by well-heeled personnel from ‘The Millionaires’ Squadron‘ at RAF Tangmere. (Tangmere is on the south coast of England, around 50 miles from Salisbury Plain, where David was training with The Rifle Brigade until August 1940). It is hard to imagine David the storyteller wanting to leave that story as “I met my missus down the pub”. No matter, love blossomed very quickly. David met Primmie’s parents, and got on especially well with her father, who was serving in the RAF at the Air Ministry and had taken part (as a sailor) in the evacuation from Dunkirk. An impending wedding was announced on Monday 16th September 1940 and took place on Saturday 21st September at St Nicholas Church, Huish, Wiltshire, one mile from Primmie’s childhood home at Cold Blow. The choir of the City of London School sang during the musical part of the service, and Primmie, dressed in blue, was given away by her father. The reception was held at Cold Blow, attended by various lords, ladies, and gentleman. The newlyweds settled in a thatched cottage near the village of Dorney, west of London and near the Hawker aircraft factory where Primmie worked as a boiler-suited bench hand until the arrival of the couple’s first son, David, in December 1942. Primula Rollo. 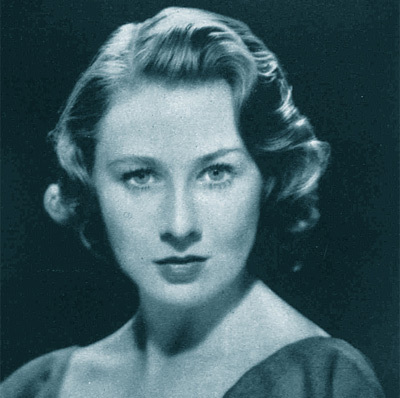 A studio portrait from the mid / late 1930s. It is something of a surprise to discover that Primmie had a credited role in the 1944 movie ‘English Without Tears’ (Re-titled ‘Her Man Gilbey’ in the US). The movie was made by the Two Cities production company, who were also responsible for David’s ‘The Way Ahead’. Both were filmed during the summer of 1943 at Denham studios. Primmie played an ATS sergeant [Auxiliary Territorial Service, the women’s branch of the British army]. All six of her words were delivered with absolute authority, as she stepped away from her office desk. And no mincing. Bravo. Primmie can be seen from 1:15:00. She is listed in the end credits as ‘Primula Rollo’. With the UK filling up with American and Canadian troops preparing for D-Day, Primmie soon became accustomed to Hollywood stars in uniform such as Clark Gable, Bob Coote and James Stewart turning up on her doorstep. “We’re shooting at Saunton Sands, which has a great resemblance to the Florida coast. Before we could work here, permission had to be secured from the ministry of war. The territory was heavily mined during the war, and many, having broken their anchorage, drift about aimlessly. David Niven found three on a stroll down the beach. They exploded one after another, uncomfortably close. Perhaps the ministry’s answer to us was correct: ‘It’s alright with us for you to work at Saunton,’ they said, ‘but we think your title ‘A Matter of Life and Death’ most apt. '” Quite. 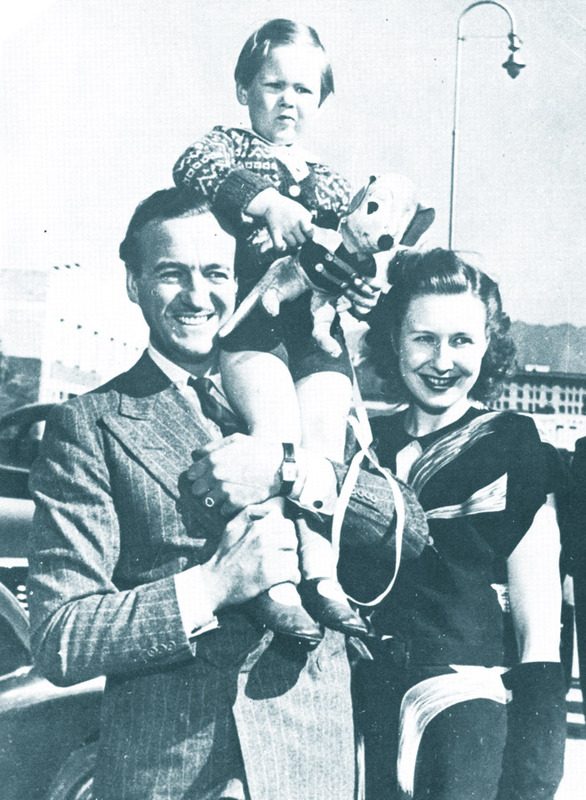 As soon as filming ‘A Matter of Life and Death’ was completed, and one month after his second son Jamie was born, David was shoe-horned onto the Queen Mary, along with 15,000 homeward bound American GIs. Primmie and the boys stayed with her father in London until she could arrange a crossing. David’s journey began three days after Hjördis Genberg set sail from Gothenburg on 7th December 1945, also solo, on her first trip to America. Their paths may well have unknowingly crossed in New York, where David took some time to unwind before continuing westwards. “His infidelity was constant and compulsive, even though he loved Primmie so much. ‘It was innate in him,’ I was told by Patricia Medina. ‘Before she arrived in Hollywood Niv was quite busy with the ladies! He wasn’t anybody’s angel. He would have been a Romeo whoever he was married to. It was just in him to be unfaithful. '” Primmie remained unaware. (It was during this time that Hjördis and Carl-Gustaf Tersmeden visited Hollywood and ended up at a party in Gary Cooper’s house. David had been invited but was unable to attend). Primmie and the boys were originally scheduled to sail for the US on 3rd February aboard the Queen Mary, packed in with several thousand GI brides and their children. When that didn’t work out, they finally arrived on 22nd March 1946, on an old freighter that encountered such bad storms it was re-routed from New York to Portland, Maine. The journey took eighteen days instead of seven. The experience was very different from Primmie’s previous trip to America. She visited New York with her father in 1938, arriving on the Queen Mary and returning three weeks later in equal comfort on the SS Bremen, which had recently held ‘the blue riband’ speed record for crossing the Atlantic. After a stop-over in New York, David brought his family to California for the first time. 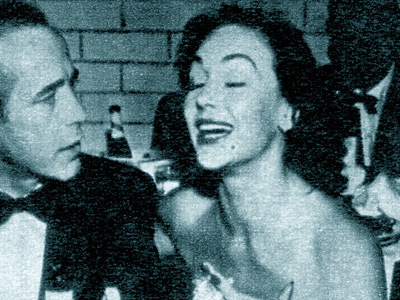 Primmie started her life there with a busy calendar of social events, due to run until David began work on a new movie at the end of May 1946. “Primmie was unique,” Pat Medina remembered. “And she said she’d never been so happy in her life.” Very sadly it was not to last. On the evening of Sunday 19th May 1946, David and Primmie were invited to a social gathering at the house of actor Tyrone Power and his wife. Hollywood gatherings had gone through various after-dinner fads for entertaining guests, the latest a variation of the children’s game ‘hide-and-seek ‘called ‘sardines’. As well as Lili Palmer ther guests at the party included her husband Rex Harrison, Gene Tierney and her husband Oleg Cassini, Richard Greene and his wife, Cesar Romero, Pat Medina, and US marine Major Arthur Little. (Tyrone Power served during the war as a US marines pilot, and was only released from active duty in January 1946). A doctor was called, and Primmie was taken to St. John’s Hospital in Santa Monica at 9pm. By the evening of Monday 20th she seemed to be on the road to recovery, but instead took a turn for the worse, and died following surgery at 1.30am on Tuesday 21st. (The surgeon was Dr Raymond Brandsma, who ten years later diagnosed Humphrey Bogart’s cancer of the oesophagus). At her funeral service on 23rd, the minister read out a message thoughtfully written by David to comfort his friends in Hollywood. “The death of ‘Prim’ Niven came as a great sorrow to her many friends, for she was one of the gentlest and sweetest of characters. She had a great sense of humour and rare capacity for enjoying life., but wherever she might be seen – in the hunting field, in the ballroom, in the WAAF during the war – she always had a sweet, rather shy smile in her blue eyes which seemed to be watching some vision that only she could see. It was, perhaps, her quiet thoughtfulness which gave that impression. She seemed so at peace with the world and everyone, appearing at the same time to be amused by it all. Her delicate beauty brought joy to all who knew her and wherever she went she radiated happiness.” Still enough to bring a lump to the throat. Sometimes pictures can tell a better story than words. Here’s a gallery of images featuring Primmie, taken between 1935 and 1946. I hope you find them interesting. 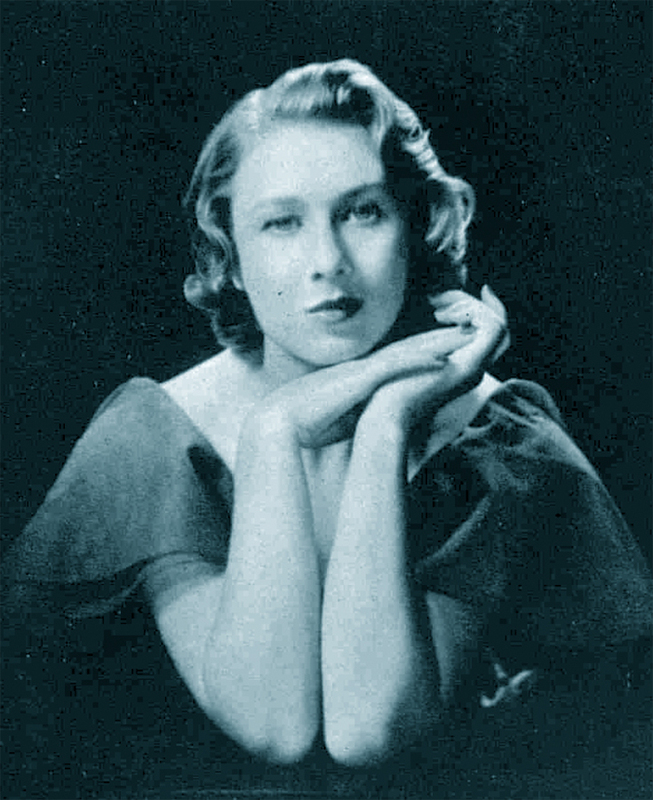 Primula Rollo, in June 1935. “One of the most attractive of the Jubilee year debutantes.” Primmie attended her first “adult dance” in May 1935, aged 17. Primmie Rollo. Studio portrait from Fayer, Vienna. November 1935. Primmie Rollo with her mother Lady Kathleen, at a Buckingham Palace garden party, July 1937. 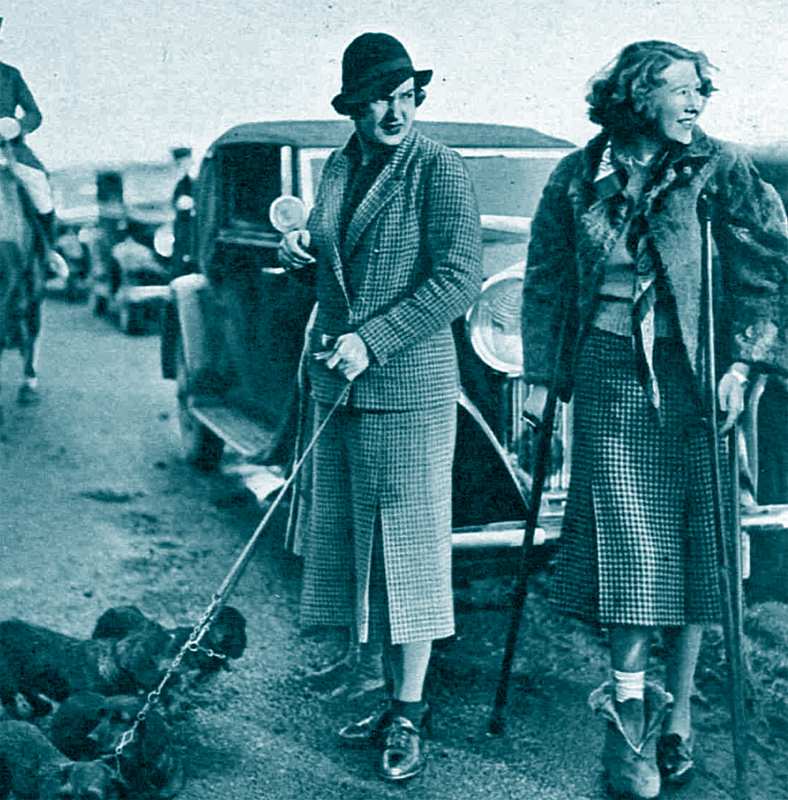 Primula Rollo watching a polo match with Princess Alexandra of Greece (Later Queen Alexandra of Yugoslavia), 1938. Primmie Rollo sitting out a dance at a ball in Grantham, 1938. Primula Rollo at London night-spot ‘The Midnight Room’. March, 1939. Primmie Rollo (second from right) watching horse racing at York, late August 1939. David and Primmie Niven emerge from St.Nicholas Church, Huish, 21st September 1940. David and Primmie Niven during the filming of David’s first wartime movie, ‘First Of The Few’, November 1941. Primmie Niven (far left) in ‘English Without Tears’, 1944. “Primmie Rollo” in the credits of ‘English Without Tears’, 1944. David and Primmie Niven, 8th June 1944, at the premiere of ‘The Way Ahead’. David and Primmie Niven, at home in Windsor, summer 1945. With David Jr.